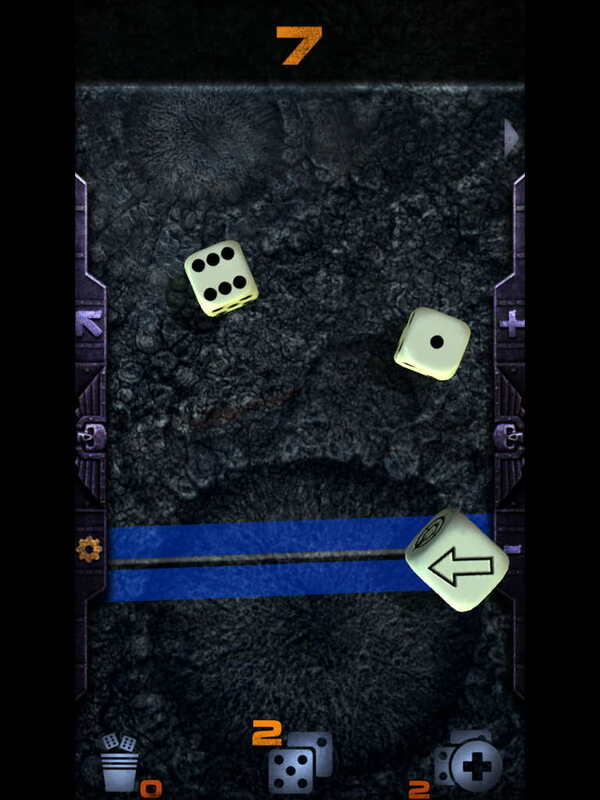 This review is a little bit of a departure from the “40K on iOS” series, as it’s not an attempt to capture the tabletop feel in a mobile game, but rather a review of a newly released tabletop utility: Assault Dice, a Warhammer 40: themed dice rolling app. Is it good, and more importantly, is it worth $2.99? Compatible with iPhone 6 Plus, iPhone 6, iPhone 5, iPad Air 1, iPad Mini 2, iPod (6th generation) and newer. I don’t have a working older device to test that on, but I’d assume that it’s accurate. The app itself is a simple $2.99 purchase, and at present doesn’t have any in-app purchases, though from the developer’s site, it sounds like faction specific add-ons with extra skins, dice, etc. will be available soon. Right now you’re limited to Generic Imperial and Just Generic dice designs, albeit nicely rendered ones. 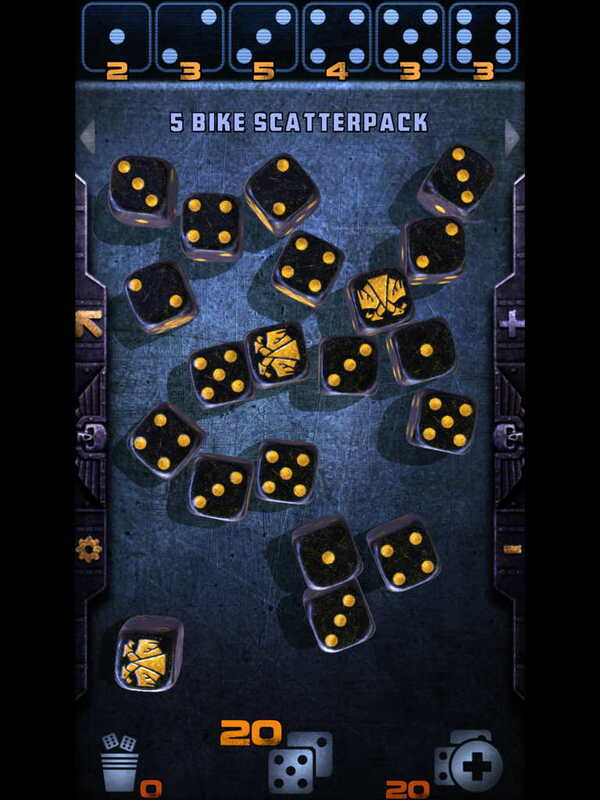 In my mind, a dice rolling app needs to do one thing, and only one thing – roll dice, and make it more convenient than actually, you know, rolling dice. If I lose the visceral feel of dice, I should be getting some fairly serious utility in return. So what does Assault Dice give you? Here you can see all the basic features of the app. Realistic, nicely modeled dice, a handy display of results, etc. The dice at the top are a particularly neat feature – tap the “target number”, and dice that don’t make it are swept into a “cup”, basically a temporary holding area, while you roll those that made it again to determine wounds or the like. All the Boyz…well, a good portion of the Boyz. What I was hoping to show you here was Assault Dice dealing with the truly annoying. The massive pack of cheap troops that end up rolling staggeringly large numbers of dice. That’s not what I’m showing you. Because the maximum number of dice tops out at 20. Adding dice, naming panels, etc. is all done via interacting with the screen. This means it’s easier on a bigger iPhone or iPad. Setting an iPad down on a crowded table “somewhere nearby” doesn’t strike me as much more precise. A lot of tables I’ve played on in my time have graveled, rocky textures to them. Unless I’m playing on a F.A.T. Mat, or something similar, I’m not putting my lovely, scratch-able iPhone down on the table. My issues don’t stop here, as there are a couple other weaknesses to the app. 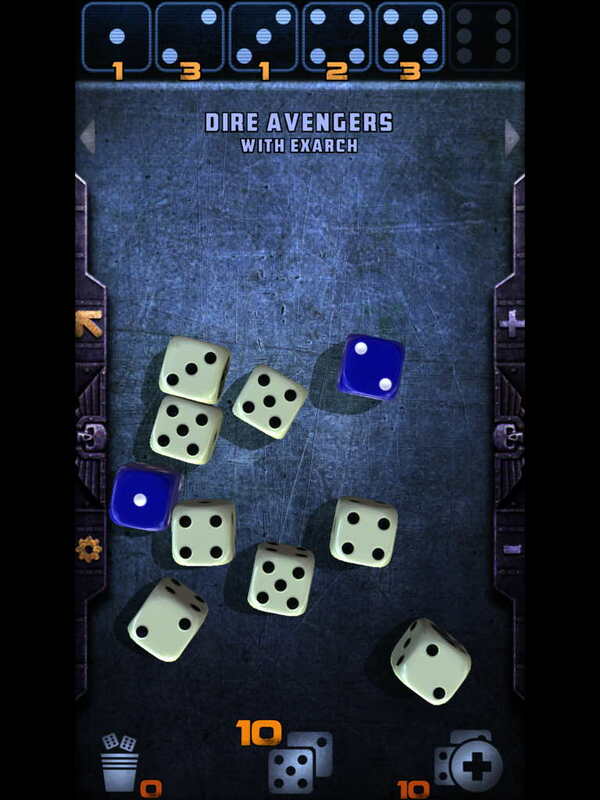 Since the most logical way to organize the panes in the app is by unit, rather than a single, dynamic dice pool (it’s a little bit of a pain to remove dice), there’s still some management to be done when managing losses – for example, when a Dire Avenger dies, their dice need to also be stored in the cup, but unlike the dice put in the cup that didn’t meet the target number, they need to not be brought out for the next roll. It seems petty, but again, you need to be making my life easier, and I’m not sure that’s what’s going on. Additionally, there’s going to be a lot of swiping through panes looking for the right unit if you aren’t running a list with lots of duplicate unit entries. 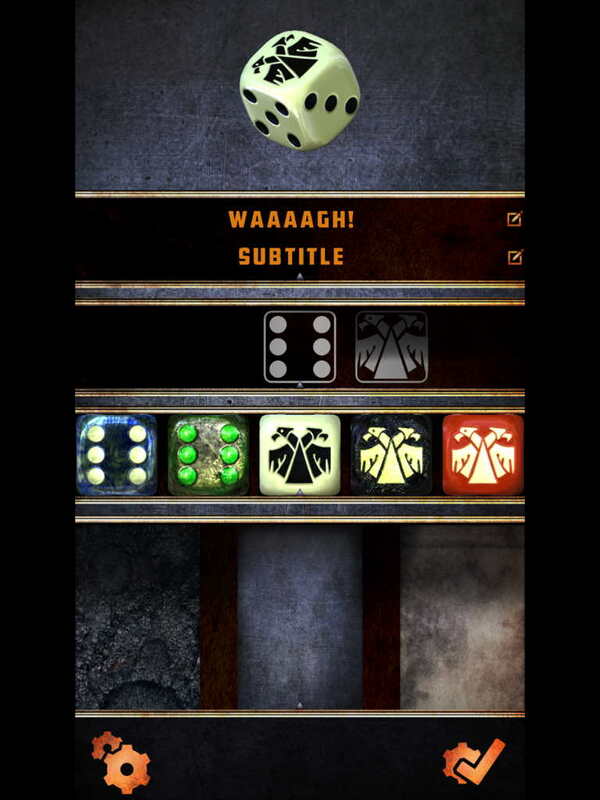 And finally, the app doesn’t support variable numbers of rolls – for example, there is no “Roll d6 for the number of shots for an Exorcist, then roll that many dice” function. That’s a pretty common type of attack in the game for there to be no mechanism to support it. But the thing that gets me the most? I just don’t understand the why. 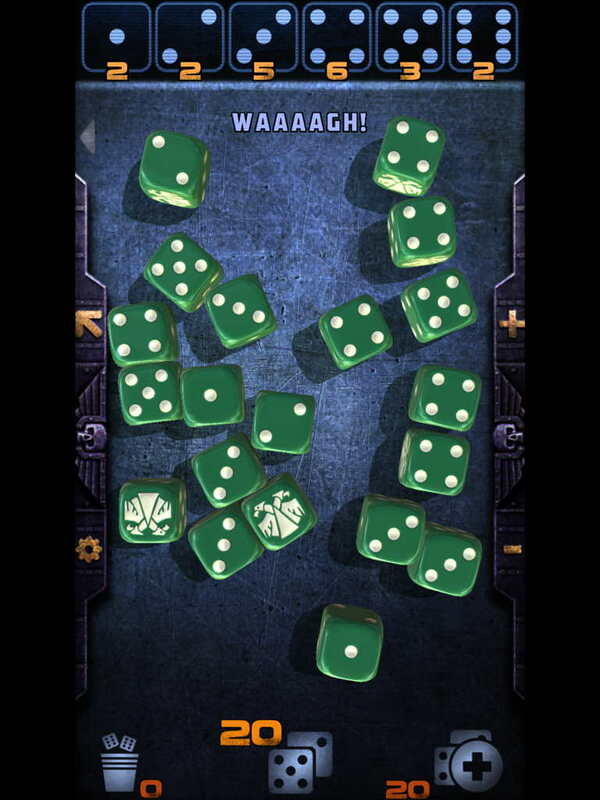 The app doesn’t get rid of the huge buckets of dice problem. If you’ve gone fully electronic having both your codex and dice app running means either two devices or flipping back and forth (and Assault Dice caused a full-on, reboot-requiring crash once during my review). I just feels like rather than helping, it’s apt to get in the way, and slow things down. The one use I can see for it is occasionally doing something like testing how the rolls for a unit “feel” when you’re away from dice (“How reliable is this really?”), but that’s a pretty small edge case. I understand electronic dice rollers for RPGs, where there’s likely a stable number of dice you roll for a particular action. But between not being able to deal with some common circumstances (variable numbers of attacks, different target numbers, etc) and I suspect slowing things down compared to physically rolling, Assault Dice feels like a solution in search of a problem. Overall Rating: 3/10. Nice visuals, but lacking in genuine utility. Well then it looks like everyone is in business NOW! Cant wait to see it “rolling”! That’s the plan. I’ve been posting and answering questions over at natfka — great user feedback coming in as well. We’re now working on our faction packs which will give you custom dice, look and feel and more based on faction selections!